We are all born intuitive eaters, meaning we are all born with the innate ability to know what to eat and how much. Think about it. When babies are hungry they signal their need to eat by crying. They are then calm until they need to eat again. Children do an excellent job at self-regulating their eating. They know how to enjoy food without guilt (ever watch a kid eat an ice cream?) and stop when they are full. Some weeks they are ravenous and can’t seem to stop eating (this can possibly be a growth spurt or they have been highly active) and some weeks they will only nibble on their food. Yet, they grow at the appropriate rate and are healthy. It balances out because they are naturally attuned to their needs and honor them – without much thought, guilt, or stress. It is when we are taught to override our internal cues, either by well-meaning parents who have told us we have to finish the plate, by being told you need to “earn” dessert, or by the constant bombardment of diet messages from society that thin is best and choosing “good” vs. “bad” food is a reflection of how “good” we are, that we start to lose our trust in our inborn ability to nourish ourselves appropriately. As we grow older we start to feed into the diet culture and the rules and restriction we are led to believe we have to follow in order to stay healthy. There is no shortage of fear-mongering headlines telling us how” eating xyz will kill you” (um, no eating doughnuts will not result in death!) or “eat abc for optimal health” (no, matcha won’t cure your illness!). It seems that the more nutrition information we have the more confused we are as to how to nourish ourselves and live healthy. Because all this does is make you doubt yourself! Intuitive eating is about learning to become the expert of your body. Because only YOU can know how hungry you are, what you like to eat, what fills you, and what your physical and emotional needs are. No diet plan can do that for you! There is no “wrong” or “right” way to eat. The best way to eat is the way that works for you. Intuitive eating, as explained by the authors of the original Intuitive Eating book Evelyn Tribole, MS, RDN and Elyse Resch, MS, RDN, CEDRD, FADA, FAND., is the process of becoming attuned to what your body needs and trusting in what it is telling you. It is creating a trust in yourself that you are capable of distinguishing emotional and physical needs and knowing how to meet those needs. It ultimately teaches you how to have a healthy relationship with food and helps you depend on your internal body cues to make food choices. It is when you become the expert of your body! To break this concept down further, Intuitive Eating is built on 10 principles. I’ll walk you through them so you can get a better grasp of the process. Reject the Diet Mentality: The first and most crucial step to becoming an intuitive eater is letting go of any diet intentions or thoughts. 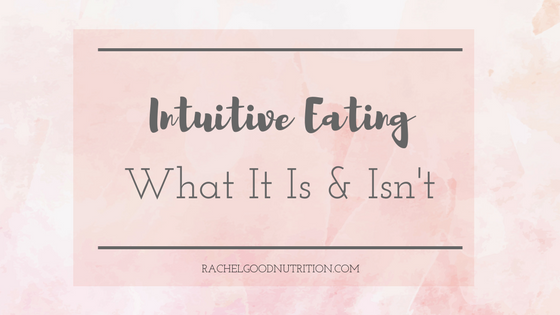 Intuitive Eating is not a diet. It’s for LIFE. Think of all the diets you have tried, of the successes that were short-lived and ultimately failed. Not because you failed, because diets fail!While there is a growing body of research showing the negative health implications of yo-yo dieting such as decreased metabolism due to loss of muscles mass, binge eating, negative body image, and weight gain (yes, dieting can actually cause weight gain!) – this is not what you need to be convinced that dieting doesn’t work and that you should give it up. Reflect on your own dieting history and ask yourself – has dieting given me the results I wanted in the long run? Am I happier now after all the diets? Do I have a positive body image as a result? Can I enjoy all foods without guilt or shame? What has dieting taken from my life? It is important to reject any thought or belief that dieting might still work as this will interrupt the intuitive eating process. Remove any rules or restrictions you set for yourself and be prepared to explore a new journey so you can rediscover the intuitive eater within you. Honor Your Hunger: Learn to recognize biological hunger signals and honor them. Food is a primal need. If you go for too long without eating and become overly hungry you are setting yourself up to overeat, because all the body wants is quick energy – it doesn’t care what it is at that point! Every time you appropriately feed your body when it initially signals hunger you are building trust with yourself and with food. Make Peace with Food: Remove the restriction and give yourself unconditional permission to eat and enjoy all foods. When you restrict and deprive yourself of certain foods you are inevitably driven to eat them. And when you do it is often in the form of binging. By making peace with food and allowing yourself all foods without judgement, you can then learn to eat what you actually like in the amounts that satisfy you. Challenge the Food Police: Everywhere you turn, especially in a social media saturated world, you will find more and more diet rules – convincing you that you need follow them to reach optimal health and to feel good about yourself. That you are being “good” if you eat a salad and “bad” if you eat a cookie. Learn to shout a resounding “no” to the Food Police – that voice inside your head that holds on to any diet rules and judges you in every food choice you make, that likes to drive the dieting cycle with guilt and shame. Feel Your Fullness: Recognize what comfortably full feels like. Pause in the middle of a snack or meal and assess how full you are. Learn to stop eating when you are comfortably full. Know that you can always go back to it (or eat something else) when you are hungry again – even if it is an hour later. Allowing yourself to eat all foods, and knowing they are available whenever you are hungry, will make it easier to stop eating when you are full. Learning to respect your fullness will build trust in yourself around food and in your body. Discover the Satisfaction Factor: Savoring and deriving pleasure from food is just as important as eating food for fuel and nourishment. This in fact is a key element of being able to eat intuitively. When you eat foods that you enjoy, without guilt or judgement, they leave you feeling satisfied and content. You will start to find that you may eat less because it doesn’t take as much as it used to satisfy you, especially when you eat foods you love. Honor Your feelings without Using Foods: We’ve all eaten emotionally at some point or another, and sometimes that’s okay. But eating to cope or numb the feelings of anger, loneliness, or boredom may bring short term comfort or distract you from the real issue for that moment – but it does little to address or fix the situation and only leaves you feeling worse. Learning to deal with emotions without food is part of becoming an intuitive eater and knowing to differentiate between physical and emotional needs. Respect Your Body: We all come in different shapes and sizes, it is time to accept that there is no one-size-fits-all when it comes to what healthy looks like. Striving for unrealistic beauty standards we see plastered in the media (many many many – if not all – magazine covers are photoshopped!) leads to unhealthy eating behaviors and unkind treatment of your body. Learn to adopt a body positive mindset and treat your body with respect by nurturing it and making it feel good. Exercise – Feel the Difference: Working out for the sole purpose of “burning calories” and “weight loss” is not a good motivator. Sure, you will be fired up to work out the first few days – but as the novelty wears off so will the motivation. Instead, learn to FEEL the difference. It doesn’t have to be a rigorous workout. A brisk walks counts as exercise, too! Notice how you feel during and after the workout. Does it boost your mood? Are you more energized? Move to feel good, not as a punishment for what you ate. Honor Your Health: Make food choices that honor your health and that you enjoy at the same time. Intuitive eating is not about perfection, it’s about progress. There isn’t one single food or meal that will cause you to be unhealthy or gain weight. “It is what you eat consistently over time that matters”. It is important to understand that this is a PROCESS. It is NOT a program with “X” amount of days that promises “X” results. It is NOT a drastic change overnight. It is NOT a diet! Learning to become an intuitive eater, or rather – reclaiming the intuitive eater you were born as, is a journey that gradually unfolds and will look different for each individual. So be patient and kind with yourself. Learn what triggers your emotional eating and what you need to do instead. 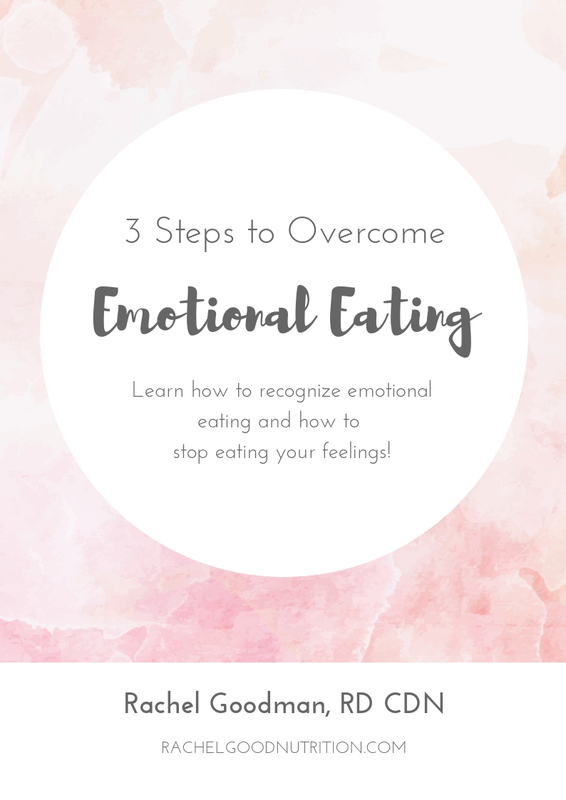 Get the Emotional Eating eguide!